Milan is internationally most successful among Italian football clubs with seven victories in European Cup and UEFA Champions League on top. The abbreviation AC stands for Associazione Calcio, that in English could be translated to "kicking club". 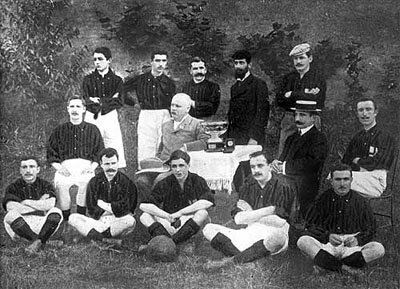 Milan team and the president and vice-president in 1901. Not that many people know that one of the most famous Italian symbols like AC Milan was actually founded by two English expatriates, Herbert Kilpin and Alfred Edwards. The exact date was 13 December 1899. From the start, the club was partly a football and partly a cricket club – at this time, the club called itself Milan Foot-Ball and Cricket Club – but pretty soon football became predominant, and the club would later rebrand to Milan FC in 1919 (the name would change again, first to Milan Associazione Sportiva and later to Associazione Calcio Milan). Milan FC quickly established itself by winning their first Scudetto two years later, and then followed it up by another two in 1906 and 1907. After a split in the club which led to the founding of their arch-rivals Inter, however, Milan had to wait for over 40 years for their next title. It came in 1951, on the back of the famous Swedish trio known as Gre-No-Li: Gunnar Gren, Gunnar Nordahl (still the club's top goalscorer with 221 goals) and Nils Liedholm. The following 20 years were much kinder to the Italian powerhouse, which won seven more Scudettos, two European Cups (the European Cup victory in 1963 was the first for an Italian team in the competition) and two Cup Winners' Cups, as well as four Coppa Italia trophies. What followed was a period of decline. After the Totonero match-fixing scandal in 1980, players and officials had bet on games, Milan was one of the team punished and demoted to the second division (the president Felice Colombo was banned from the game for life). Even though they returned to Serie A the very next year, they were relegated again in 1982. They managed to claw their way back to the top division, but the club soon found itself on the brink of bankruptcy, before it was taken over by Silvio Berlusconi in 1986. Milan players and Berlusconi in his early days as a football club owner. The controversial media tycoon and politican Silvio Berlusconi was the owner of AC Milan in more than twenty years, until 2017, when the club was sold to a Chinese investor. Berlusconi's appointment saw Milan return to their paths of glory. Helmed by the talented young coach Arrigo Sacchi, AC Milan quickly became a force of nature, winning their eleventh Scudetto in 1988 and two European Cups in the two years that followed. The performance in the 1988-89 edition was extra impressive with 5-0 against Real Madrid in the semi-final and then 4-0 in the final against Steaua București. The glorious Milan team, led by the Dutch trio of Ruud Gullit, Frank Rijkaard and Marco Van Basten, has been voted as the greatest team in the history of football. Besides the huge amount of talent on the field it was also a success that was due to Sacchi's zonal marking system. The club's dominance continued into the 90s with Fabio Capello installed as the new coach, with the outcome of a more defensive approach at the field. This period saw "Gli Invicibili", as the club's new nickname were, add five additional Scudettos to its tally, as well as another Champions League trophy with a memorable 4-0 rout over Barcelona in the final. The Dutch stars was gone, but other stars like Marcel Desailly, Dejan Savićević and Zvonimir Boban had replaced them. AC Milan were less successful in the new century due to Inter's dominance, but the club still managed to win two more Scudettos, two Champions Leagues and their fifth Coppa Italia title. The Derby della Madonnina or the Deby di Milano between Milan and Inter is often fierce competitions. The statistics is very close between the teams and in 2016 Inter had the lead with 77 won games against 75 won Milan games. Some of the most prominent players of "I Rossoneri", one of the club's nicknames, in the new millennium have been Andrea Pirlo, Clarence Seedorf, Kaká, Alessandro Nesta and Andriy Shevchenko. On January 29, 1995, a tragic event happened that overshadow the team ’s performance. A Genoa fan was stabbed to death outside the Genoa stadium by Milan ultras. Milan has through the years had different ultra groups whereas the c group called Fossa dei Leoni being most known. The logo has the initials “ACM” (standing for AC Milan) at the top and the number 1898 (the year of establishment) at the bottom. The space in the logo's center is vertically divided by two flags. To the left is a flag with the team’s red and black colors and to the right a flag with a red cross – this is the cross of St. Ambrose's, a patron saint of the city of Milan. 1899 The club is established as Milan Foot-Ball and Cricket Club. 1901 Winnings its first scudetto. 1905 Winnings its first Palla Dapples. 1908 After an internal dispute, breakaway players form Internazionale Milan. 1919 The club change name to Milan Football Club (Milan FC). 1926 Moving to San Siro. 1936 The club change name to Milan Associazione Sportiva. 1939 The club change name to Associazione Calcio Milan (AC Milan). 1949 Gunnar Gren, Gunnar Nordahl and Nils Liedholm (known as Gre-No-Li) are transferred to the club. 1963 Become the first Italian side to win the European Cup. 1967 First Coppa Italia victory. 1969 First Cup Winners' Cup victory. 1969 First Intercontinental Cup victory. 1988 First Supercoppa Italiana victory. 1980 The team is demoted to the second division due to a match-fixing incident. 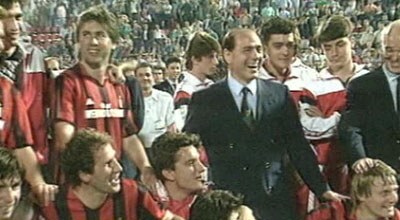 1986 Silvio Berlusconi become the new club president. 1987 Arrigo Sacchi is appointed as manager. 1994 First Champions League title. 2007 Winning FIFA Club World Cup.